Barnes & Noble knows where it stands in the tablet race. Sure, the company has been plugging away at the space since the day the Nook Color made its transformation into a full-fledged tablet, but the Nook, it seems, is rarely mentioned in the same breath as the Kindle Fire or Nexus 7, when discussing low-cost tablets. As such, the company seems to rarely mention its devices without discussing the competition -- Amazon in particular. 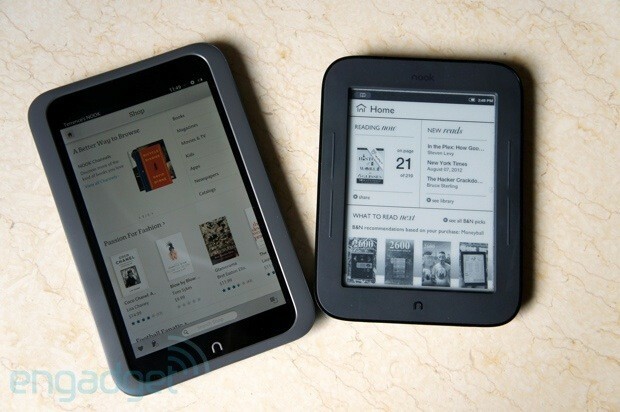 In fact, at the launch event for the Nook HD and HD+, reps trotted out Kindle Fire HDs at every possible opportunity. Seeing the two devices side by side, there's no question that Nook trumps the Fire in a number of categories, and the bookseller has gone a ways toward making the Nook HD stand out in a field full of bigger players. For one thing, the device is far more focused on the reading experience than the competition, a fact reflected in both hardware and UI decisions. The company has also taken a more aggressive approach toward marketing the device toward families. The question, then, is whether these features are enough to capture marketshare from the more prominent devices. 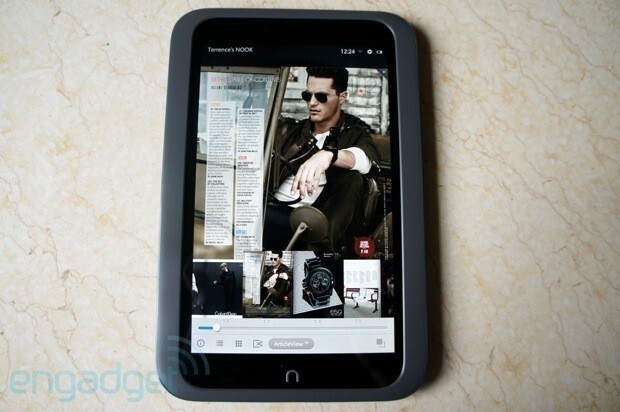 See how the Nook HD stacks up after the break. 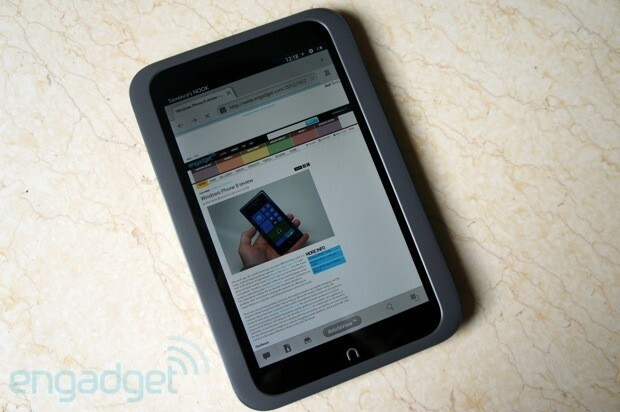 The Nook HD is a nice piece of hardware at a great price that's hampered somewhat by skinned Android. 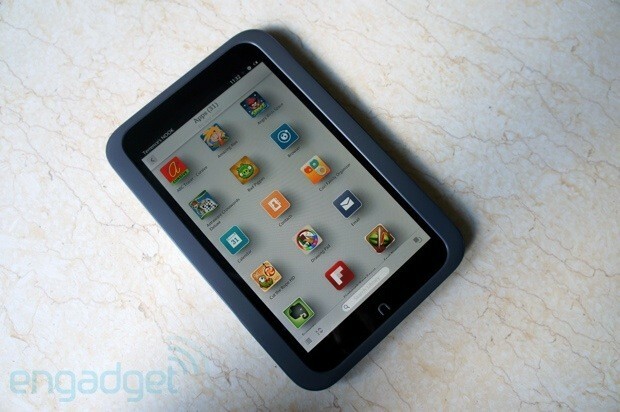 How would you rate the nook HD? The Nook Color / Tablet scored plenty of points for originality in the industrial design department, polarizing users in the process. The long, plastic-shelled body did a fine job of standing apart from the push toward all-screen slates that has gripped the vast majority of the industry over the past several years. That's thanks in no small part to a carabiner that wouldn't have looked altogether out of place strapped to your trusty hiking backpack. Devotees of that old design will find some solace in the slimmed-down and souped-up arms of the HD+. The HD, on the other hand, wouldn't seem too out of place hanging out at the open bar of a Simple Touch family reunion, with a stubby body, rounded corners and slightly concave back, created by Robert Brunner, the former Apple designer who breathed life in B&N's popular reader series. Function over form is what Barnes & Noble is selling this time out. That's not to say the Nook HD is a particularly bad-looking device, but as with the Simple Touches, there's little doubt that the company sacrificed a bit of sleekness in favor of building a slate around the human hand, a noble enough pursuit so far as tablet industrial design is concerned. As with B&N's other recent products, the Nook HD's got bezel to spare -- a plastic affair that shields the sides of the screen from both dings and thumb prints, making sure those greasy digits don't smudge the pristine HD display at the center of the device. Next to this, you'll find a black display bezel that's wider on the top and bottom of the device. The area's a bit of a no man's land along the top -- there's no camera to be seen on the Nook's front or rear. It's a sacrifice the company seemingly made in the name of keeping costs low -- one of the few fronts the company seems willing to admit it got beat by the Kindle Fire HD. While most consumers with money to spend on a new tablet are likely not lacking on the devices-with-cameras front, in late-2012 at least one built-in webcam seems like a pretty baseline feature. That's particularly true for an easy-to-hold, high-def product that might have made a nice little Skype device. On the bottom black bezel, you'll find the Nook's signature lowercase "n" physical home button. It's the one truly conspicuous input on the device, placed there, no doubt, for aesthetic consistency and, B&N tells us, so that you'll never forget which way is up -- not that such orientation makes a heck of a lot of difference when the accelerometer is hard at work. A small seam splits the front plastic bezel from another, slightly shinier piece of plastic on the side of tablet. This bit houses the Nook's other buttons. You'll find two volume buttons on the right and power on the left (give the screen a second or so to turn on after clicking the power button). It's not quite as intuitive as having a power button on top, but let's face it; the dream of relatively uniform button placement went out the window years ago. Up top, you've got a headphone jack and small mic hole that allows you to, among other things utilize the company's great Read and Record feature for kids' books. On the bottom, there's a proprietary charging jack. 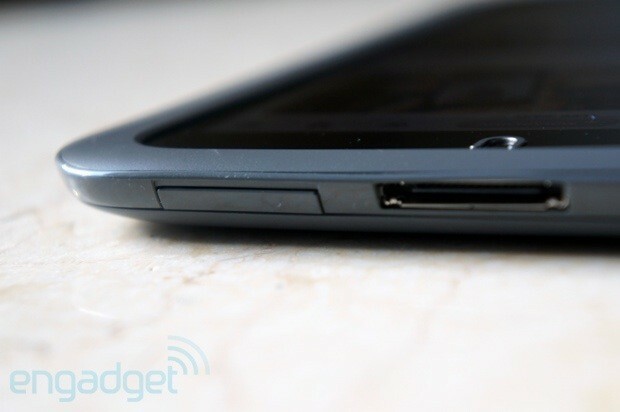 When asked why it went that route vs. the nearly ubiquitous micro-USB (the choice on the tablet's e-reader siblings), the company claims that it's, in part, due to the ability to speed up charging. Given how many micro-USB cables we've got floating around, that would have been a nice choice -- and hey, it's good enough for the Fire HD and Nexus 7, right? Barnes & Noble's quick to point out, however, that, unlike the Fire, the price of the Nook includes the necessary (again, proprietary) cable, along with a wall adapter. To the charging port's right, a small yellow light turns green when the battery's full. To the left of this port is a microSD door that'll let you expand the device's 8GB or 16GB by up to 64GB, always a welcome feature on Nook devices, particularly in the case of a tablet, where, unlike e-readers, you'll probably actually be storing some HD multimedia files. It's also a boon for those who found past Nook tablet devices such a delight to root. The rear of the device has that familiar soft-touch feel, which really feels nice in-hand, and offers a bit of traction for those sweaty palm you get while using the device on the elliptical machine. As with the Simple Touch devices, the rear indents a bit, providing a slot for your fingers to rest in while reading. However, it's far less pronounced here and honestly doesn't really serve all that much of a purpose. In the center of all of this, as per usual, is a large, indented lower case "n," should you ever forget which tablet you bought when it's faced screen-side down. Along the bottom of the rear, two small speaker grids flank a small "nook" logo and all of the requisite FCC information (interestingly, the pricier Nook HD+ only has a single speaker). (Update: Barnes & Noble contacted us to clarify that the HD+ has two speakers, they're just both behind a single grille.) We prefer the spread-out placement of the stereo speakers on the Fire HD, which make it a bit harder to accidentally muffle the sound while holding the tablet during a movie -- not that the sound on the Nook HD is all that much to write home about, SRS TruMedia or no. It doesn't really get all that loud. For most occasions, we suspect we'll be relying on that headphone jack up top for our multimedia needs. On a whole, Barnes & Noble's done a nice job here on the industrial design front, creating a tablet that's easily held, thanks in part to a slim width (7.7 x 5 x 0.43 inches to the Fire's 7.6 x 5.4 x 0.4) and light weight (11.1 ounces to the Fire's 13.9). The 7-inch 1,440 x 900 IPS display really does pop, offering up great viewing angles and the sort of high-definition playback it would have been hard to imagine on a $200 tablet not all that long ago. The Nook also scored a solid 1,271ms score in our SunSpider testing. The plastic bezel on the front provides a nice spot on which to deposit one's thumb and, like the Simple Touch, provides for a design that stands apart from the army of lookalike tablets that dominate the market. 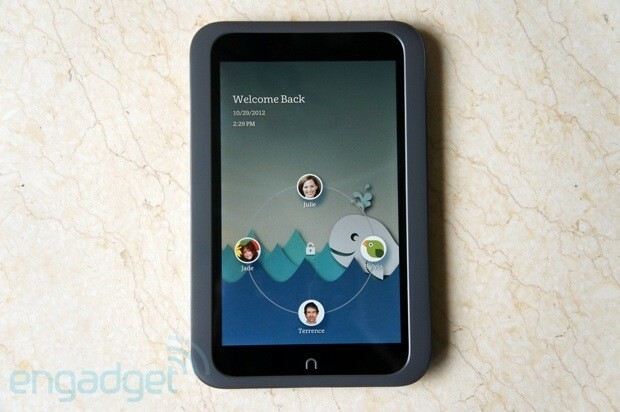 The Nook HD is running, hold onto your hats, Ice Cream Sandwich under the hood. Barnes & Noble is far less cagey about Android versions than Amazon. That's perhaps because, while it's a highly skinned version, it's far less so than the one you'll find on the Kindle Fire HD, which essentially secures that tablet's place as a content delivery device. Click the power button and you'll see a lock screen welcoming you back, along with the date and time. In the center is a lock icon surrounded by faces representing different user accounts. Drag yours to the center and you'll open up access to your content. When switching to a different user, you'll get a split second view of the content on the previous user's desktop, a small bug the company will hopefully fix with the next upgrade. Barnes & Noble's calling skin "paper-like" (not to be confused, of course, with Paperwhite), a dull name, we'll admit, but it certainly gets to the heart of the matter. The company's gone a way toward providing a minimalist experience, not overcrowding things with flashy features that are unnecessary to core usage. At top is a black toolbar letting you know whose Nook you're looking at. There are notifications in the center that you can tap to read (rather than the customary notification pull-down), the time, WiFi indicator, batter listing and settings icon. Tapping Settings lets you adjust brightness, switch WiFi networks, enable airplane mode and toggle lock screen rotation. By default, the desktop is mostly bare, with visible fibers that really drive that whole "paper-like" thing home. At top, you'll see the date, your account icon and another little welcome message custom-fit to the time of day. Below is the Daily shelf, a small carousel featuring quick, rotating access to your most recent content -- movies, newspapers, books, apps, comics, et al. It's not unlike what you get on the Kindle Fire HD, but it's far less central here. Below this is an open area onto which you can drag content and apps. There are five desktop pages in all, so you've got plenty of area to play around with. Toward the bottom of the page are links to your library, apps, the web browser, email and the Nook store. Down farther still are a search bar and a button that gives you quick access to all your open apps. 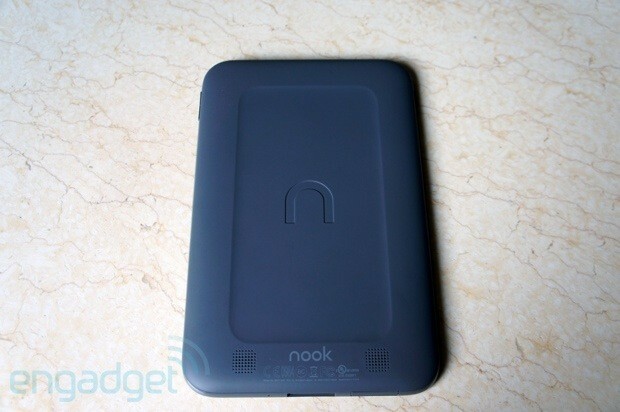 Barnes & Noble introduced Your Nook Today for this round of tablets. Clicking this will drop the page down with a cool little animation that breaks the sticker. The first time you launch the feature, the page will take a bit of time to populate -- especially on a lackluster connection. At the top, you'll get the current local weather, along with the current highs and lows, courtesy of AccuWeather.com (a hugely desired feature, according to B&N). The page also features reading recommendations, based on your habits and a quick "Three Minute Read," for the on-the-go person who wants to feel they've accomplished something in an exceedingly short space of time. The library page offers up all of your content broken down by category -- books (including comics), magazines, movies and TV, apps, kids (including all content from all mediums that fit in the category), catalogs, newspapers and various methods for refining your own content, live shelves, scrapbooks and files. Content in the different categories is organized into rows that can be advanced with a swipe. Clicking on the header will bring you to a page that features all of that content laid out on grid. As with the homepage, the layout features a lot of white space -- a defining characteristic of the UI, which, compared to the vanilla Jellybean offered up on the Nexus 7, feels a little half-baked. Though for those looking for a simple tablet that doesn't overwhelm the senses, there's perhaps something to be said for Barnes & Noble's approach here. The aesthetic carries over to the Apps page. The icons certainly pop when placed on the dull white background, surrounded by so much white space. Barnes & Noble's offered up a fairly straightforward browsing experience this time out -- precisely what one would look for in a starter tablet like this. At the top, you've got tabs which can be added to with the click of a plus sign. Below this, you'll find the navigation bar and buttons, and a bookmarks icon that will bring you to a list of browser thumbnails on a plain background. Along the bottom are icons for sharing (via email and Evernote), searching and the ArticleView, which adheres to the device's central reading focus by serving up web stories in a more magazine-like format. Clicking the top right lets you add a bookmark to the page you're currently reading and brings up access to further reading settings. Reading is still the essence of the Nook line, and in a sense, like the Nook Color before it, the HD can be regarded as a reading device with some extra tricks up its sleeves. After all, the company clearly designed the form factor around the reading experience. Accordingly, in press materials for the company, reading is regularly mentioned ahead of things like movies and apps, in spite of the push toward a higher-definition display. Not much has changed on the prose-reading front. You get a page largely monopolized by text, save for the book title on the top and your progress on the bottom. Page turns default to a standard swipe, though fiddling with the settings make it possible to add a more book-like page curl animation that features some intentional image bleed from the page before it. Click the progress at the bottom and you get a slider that lets you flip through the book. You can also get information on the book (cover, reviews, recommendations), word and phrase search, sharing and format adjustments -- which offer up eight text sizes, six font styles and six page colors, among others. 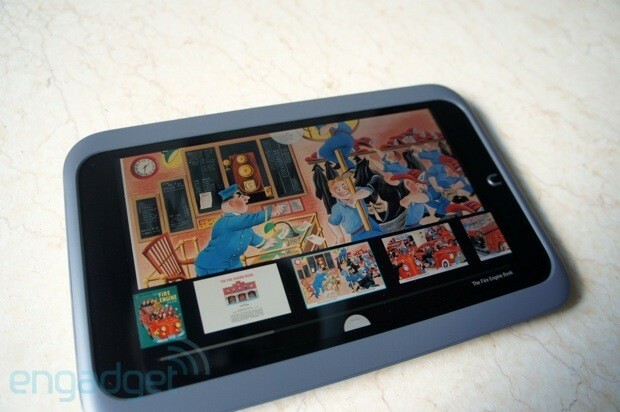 More visual texts are where the Nook HD really shines. Magazines like Details really do look stunning on the HD display. And while the Nook HD+ offers up a better form factor for such reading, you can home in on text with a pinch. For a more straightforward reading experience, Barnes & Noble is offering up the same ArticleView you get in the browser. Click it and the images disappear, offering up a layout similar to the printer-friendly format offered up by many news sites. Tap the bottom of the screen, and you get a carousel of article pages. Below that is a link to a grid layout that offers up the whole book laid out as thumbnails on a single page. You can also view the contents via a more traditional TOC. The whole experience is tied together with excellent transition animations, making for a smooth and seamless reading experience. For all the unfinished feeling one gets navigating through the UI, it's clear that B&N invested a lot in magazine reading this time out. 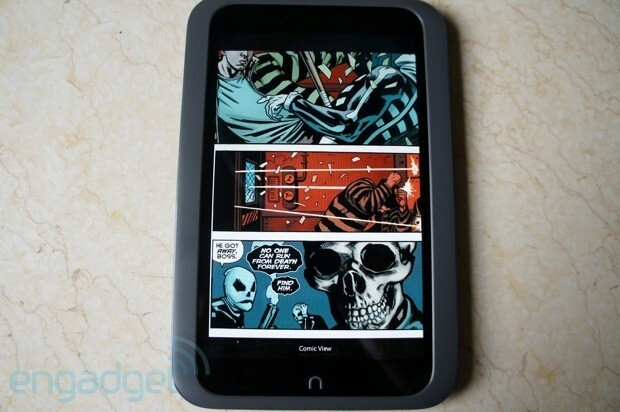 Comics, too, are a pleasure to read on the Nook HD. The colors really pop and enabling ZoomView Letterboxing makes it possible to read panel by panel, really the ideal way to enjoy sequential art on a tablet device. As with magazines, you can also view a carousel of pages on the bottom of the screen, along with textual and visual tables of contents. Barnes & Noble added shopping catalogs to its list of reading options. The viewing options are quite similar to those of magazines, only these get pushed to you for free, because, well, their sole reason for existing is to sell you products. The images feature hotspots, which, when clicked, bring you to product pages where you can purchase products. They look great, sure, but in a world in which catalogs are still widely considered junk mail for most consumers, it's hard to imagine the feature serving as a major selling point for most users. Kids' books, meanwhile, have long been something of a secret weapon in Barnes & Noble's tablet offerings. The company has worked closely with manufacturers to offer up an experience that really goes the extra mile to harness the multimedia capabilities of the devices, adding sound effects, animation and music. Opening up the book offers up three different experiences: Read By Myself, which offers up no narration, Read and Play, which features built-in narration and Read and Record, which lets parents record narration for their kids. As with other texts, clicking the bottom of the screen offers up a carousel of pages from the book. All of this, coupled with the low price, relatively durable design, small form factor and user profiles make a compelling argument for the Nook HD as a strong device for families. The whole process is extremely simple, and once a profile has been created, it will be synced over to other Nook devices linked to the same account. As evidenced by the lock screen, Barnes & Noble is really pushing the profile feature this time out -- and it's not hard to see why. Families share tablets, particular inexpensive ones. But while you might not mind handing off a $200 tablet, you don't necessarily want to put all of your content into your kids' hands. You can set up to six profiles per device by clicking your user icon on the home screen. From here, it will give you the option to create a profile for an adult or child. You can change the profile image using built-in clip-art or pictures stored on the device and pick a gender (you can also opt for a non-gender-specific version). Filling in the age on the child account helps Barnes & Noble determine "age-appropriate content." On the following page is a checklist for different content types you can let the children access, as well as rating levels for movies and TV shows. Once you've filled all this out and picked a few interests, the Nook will recommend free content to you. The Nook Shop design is fairly straightforward, offering up a rotating carousel of featured content in the upper left, with a list of pages of different content (book, magazines, movies & TV, et al) to its right. Below this are further recommendations broken up by categories like "Passion for Fashion" and "Your Favorite Heroes" (comics). If you know what you're searching for, however, just skip straight down to the search field at the bottom of the page. It should be pointed out that, like the Fire, the Nook's skinned UI means you're getting no access to the Google Play store. The company is instead opting to work with developers to create apps that better fit their device. And while B&N claims to have all the popular apps, there are some conspicuous absences here -- searching for Spotify, for example, will only offer up a copy of the $12 e-book, "Spotify for Dummies." Who knew such a thing existed -- and really, without access to the app, who would ever need such a thing? Barnes & Noble invested a lot in the hardware, and it shows. The Nook HD has a great little screen, snappy performance and industrial design that stands out from the competition without proving quite as polarizing as its predecessor. 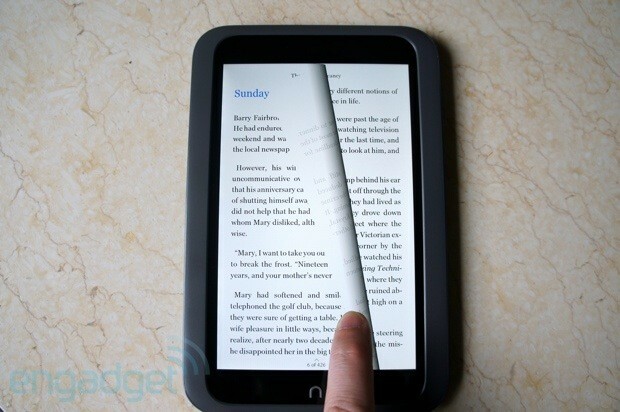 Most of all, it's built to be held, a fact that echoes the device's focus on the reading experience. That core functionality spills over onto the software side, making visually interesting magazines, comics and kids' books a pleasure to read. Priced (ad-free) at $199 for an 8GB model and $229 for 16GB, it's a great little piece of hardware for those looking for a reader that can also handle casual gaming and high-def videos. And the addition of profiles makes this a tempting proposition for families with children. The "paper-like" UI, on the other hand, doesn't feel as if it got quite as much attention. It's stark and at times buggy (though the company promises that a fix is coming shortly), missing both the content focus of the Kindle Fire and the full functionality (and Google Play access) of the Jelly Bean-rocking Nexus 7. Also, the lack of a camera feels like a strange oversight. All said, however, the Nook HD is a fine little tablet for the price, though in a space where the Kindle and Nexus have been crowned champions, asking people to make the leap feels like a bit of a hard sell.